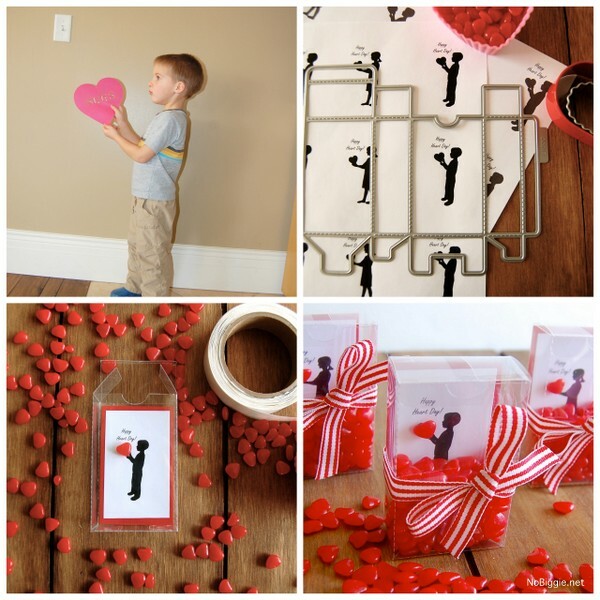 Make personalized silhouette valentines for Valentine’s Day! I love pulling these sweet silhouettes out for Valentine’s Day decor every year. 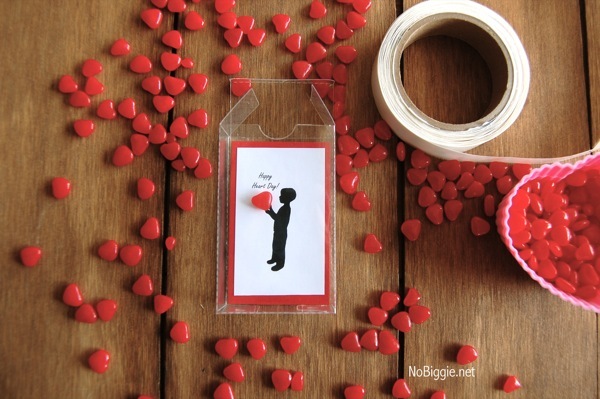 Such a simple sweet project and they make fun Valentine’s to give too! I’ve always wanted to make silhouettes of my kids, but have just never gotten around to it. I finally did it! 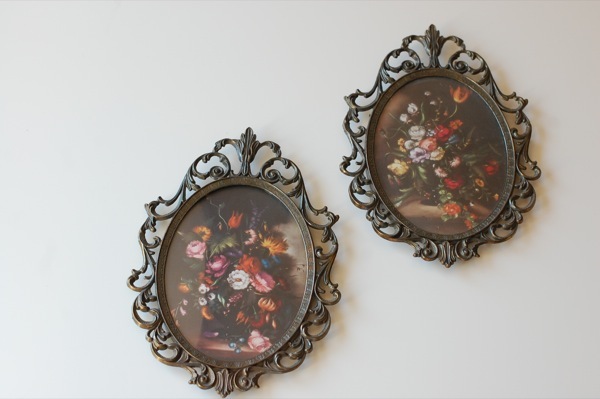 This project all came about after a successful trip to the thrift store.I found these great frames that were just begging for silhouettes in them. Cool frames are always a fun thrift store find. Although these frames were not made in the USA, they WERE made in Italy, which is something you don’t find these days…kind of a cool detail. We started out by taking pictures of the kids against a solid white background. We had to take a bunch of photos here, to get it right. We ended up with these two images. Here they are up on the wall. It’s hard to get a good picture without a glare on the glass. They look great in person! We also did simple head profile silhouettes to swap out when Valentine’s Day is over. 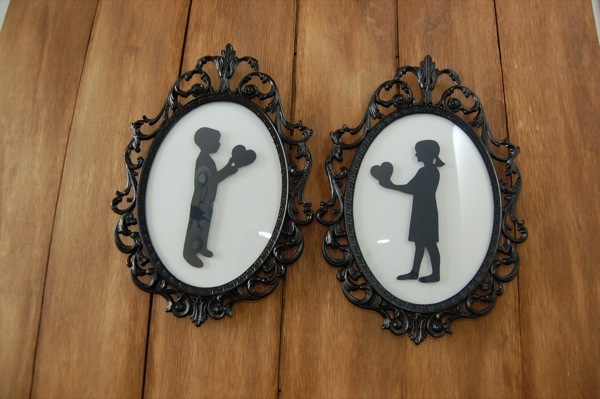 One of the neat things about these frames, is that the glass is rounded a bit, so I was able to add those little foam pop dots to give these silhouettes a bit more dimension, creating a little shadow behind them. From there, we made a bunch of little printed silhouettes for valentines. Using this rectangle box die and clear plastic sheets, I made little clear boxes. I also cut the printed silhouettes down to size and gave them a red border by mounting them on red card stock. 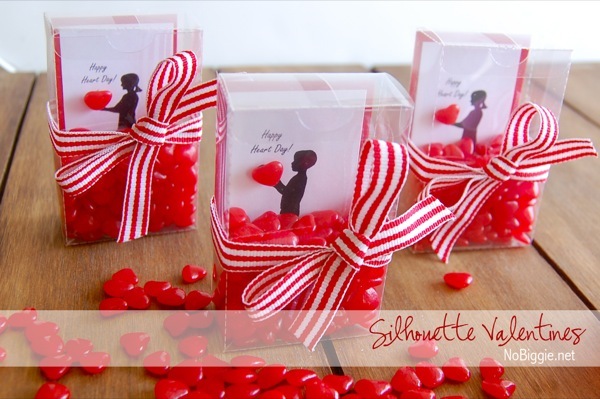 Next was the fun part…filling the little clear boxes with tiny red cinnamon hearts. I first started with adding a tiny glue dot to one right on top of the silhouette heart they are holding. Here’s a fun little video with a more step by step look at how it all came together. That’s it! Simple and personalized valentines for the big day next week. 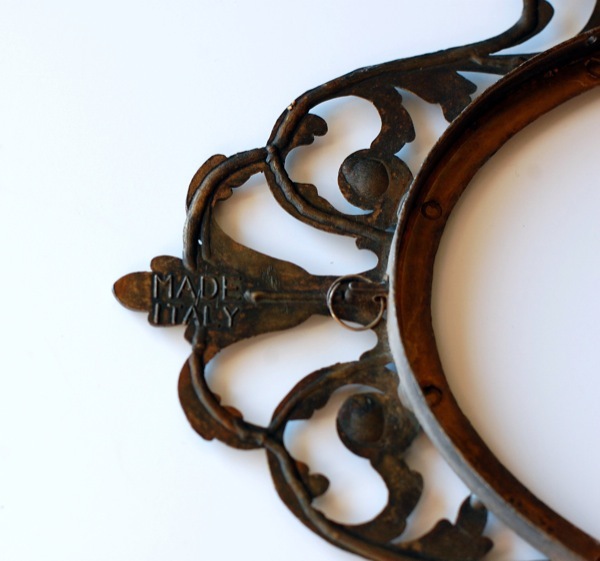 What I am really interested in is how you managed to get the pictures out of the frames without damaging anything. I have the SAME pictures, handed down to us by a family member. I’ve wanted to reuse the frames, but I’ve been afraid of messing the whole thing up! Just go for it! For some reason, I have no issues with taking things like this apart to make it what I want. You should just do it. Wow you guys – those are awesome! 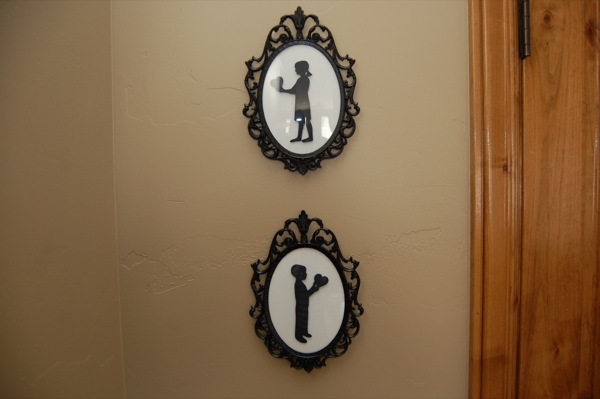 The best silhouettes I’ve seen…bc you can totally tell its A and A. Love them in the boxes. Happy late bday Kami! WOW! girl, you are SO creative. I need to use that silhouette tool on photoshop. Love this idea! i have never made silhouettes of my girls, but would love to. I love your craftiness. Love this post, but can I ask, where did you buy the sheets of plastic? 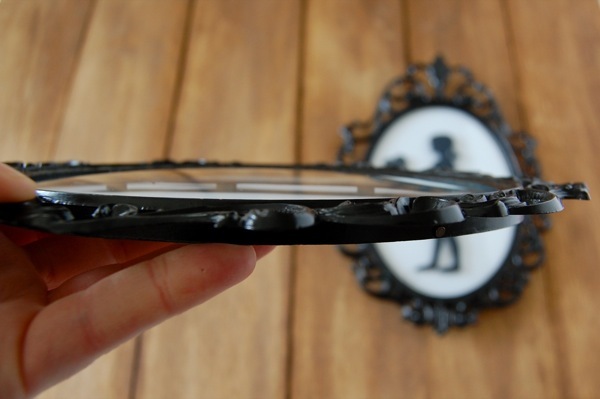 I linked to where you can buy the plastic sheets on Lifestyle Crafts. You are my hero, and those frames are TDF! Probably the best thrift store find EVER! TOO CUTE! The valentines are cute and the silhouettes in the frames are even cuter!! Love it! Holy cow these are the cutest! Oh my gosh. Adorable. Seriously, Kami – you are so talented. What an adorable idea! You are a genius!!! love this and what cute kids you have! Love these!! You are too crafty for words! Amazing! Can’t wait to see them in person!! Omgosh! so cute! LOVE LOVE LOVE THIS POST!!!!!!!!!!!!!!!!!!!!!!!!!!!!!!!!!! 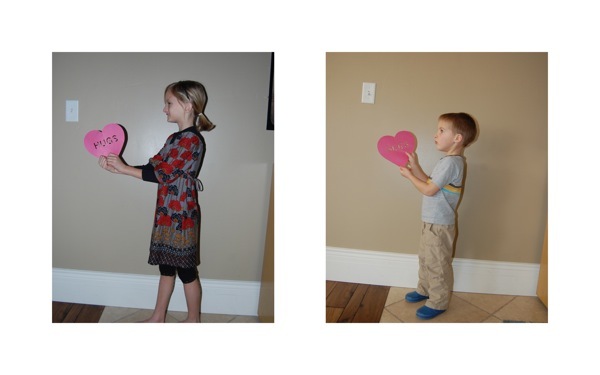 BTW I got my heart chalkboards- they are adorable… thank you! I love them! When my 23 year old son was about 1 we went to an Artisan Fair and we had a sillouette cut out of his head….free hand. The artist was amazing and I still treasure that picture! This is adorable — I must do this with my grandkids. And I love the frames. What a treat! Those frames are early 1970 home interior frames. My mother was a hostess, Our family pictures were in all of them. Little 3×5’s all the way up to the family photo, 11×14. They all came with that flower paper insert. Still pretty . Great Ideas. These are crazy cute! 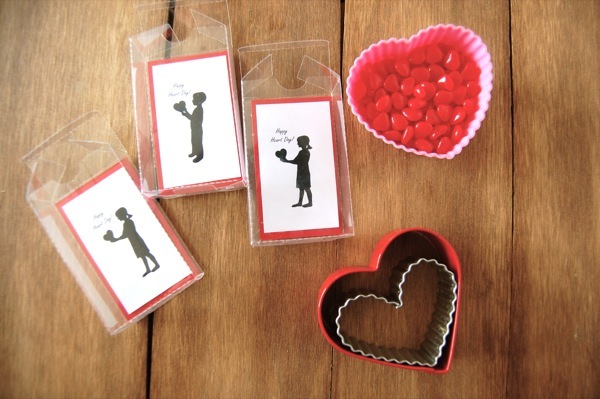 The clear boxes are the perfect way to show off your darling silhouettes and candies. Darn that I already bought stuff for my kids’ Valentine’s! Pinning for next year! These are just so adorable Kami! These are just perfect! I love thy are both art for you house and for the valentine’s! adorable! 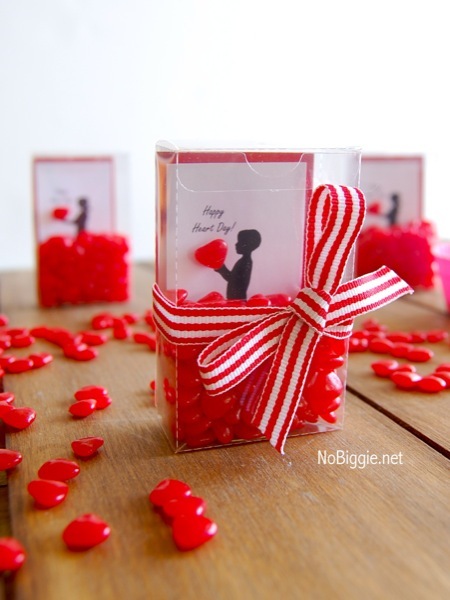 Thank you for a stunning tutorial on the valentines boxes…never thought of cutting the boxes out of plastic…so cool!